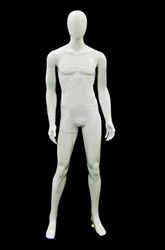 Our unbreakable, plastic male egghead mannequin has a turnable and removable head. His sophisticated white appearance is eye-catching and will make any showroom come to life. Our unbreakable male egghead mannequin is durable and will be excellent in any high-traffic display. Standing pose. He comes with a glass base and metal calf support rod.